Obituary – Magruder, Joe Albert « Perry High School Alumni Association, Inc.
F.F.A. 56-57, F.F.A. Treasurer 56-57, Wrestling 55-58, Lettermen’s Club 56-58. Joe Magruder, 41, Conroe, Texas, formerly of Perry, died Saturday as the result of a diving accident at New Braun­fels, Texas. Funeral will be at 2 p.m. Tuesday at Parker Funeral home with Rev. Fred Selby, pastor of the First Baptist church of Perry, officiating. Burial will be at Grace Hill cemetery. Magruder was born May 16, 1940, at Perry, the son of Harold and Martha Magruder. 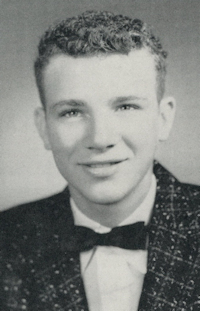 He was a 1958 graduate of Perry high school and married Linda Eastin in 1958. He worked in the Houston, Texas, area the past eight years and had been an inspector for Protection Mutual Insurance Company. In addition to his wife, Linda, of the home, Magruder is sur­vived by two sons, Jeffrey, of Conroe, and Devon, of the home; his father, Harold Ma­gruder, Perry; two brothers, Hollis Magruder, Sulphur; and Mike Magruder, Perry; and a sister, Mildred Sue Parrish, Kansas City, Mo.